Deeper Smart Sonar Pro+ is a top choice for anyone serious about angling, ice fishing, or canoeing. 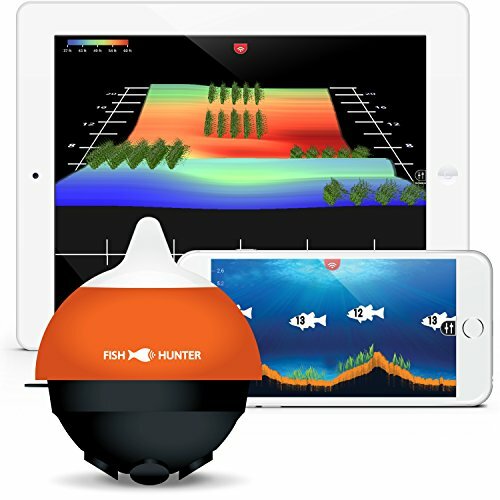 This is a castable fish finder is portable and supports connectivity to IOS or Android devices via Wi-Fi. 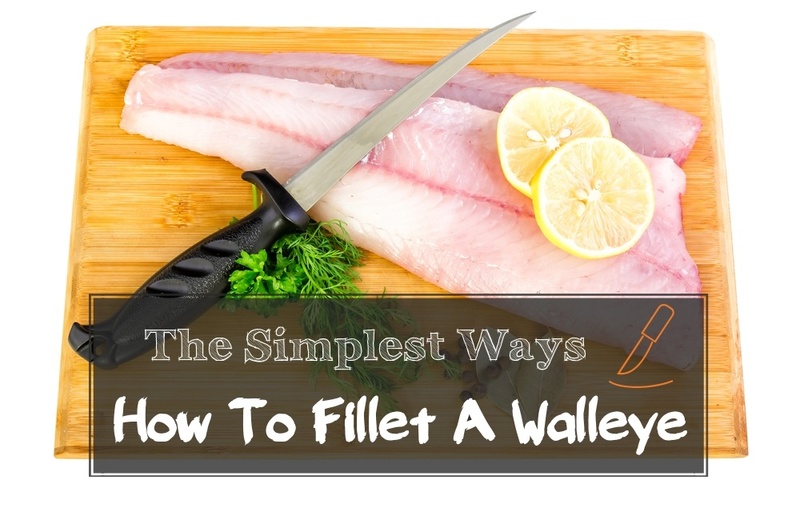 It eliminates the need for cellular data to connect to your fish finder. Deeper Smart Sonar Pro+ is recommended for anglers who fish along riverbanks, on boats, or on rapid waters using Kayaks. This modern fish finder can also be handy when float tube fishing in fresh or salty waters. Deeper Smart Pro+ sonar has a transmission range of 330ft and can track any object to a depth of 260ft underwater. An inbuilt GPS system allows you to map the exact angling location. With every signal you send and receive, you are able to know the exact location of fish, underwater geography of the waterbed, type of vegetation growing in it and even the existing temperature of the immediate environment. Venterior portable fish finder can be an alternative to Deeper Smart Sonar Pro. 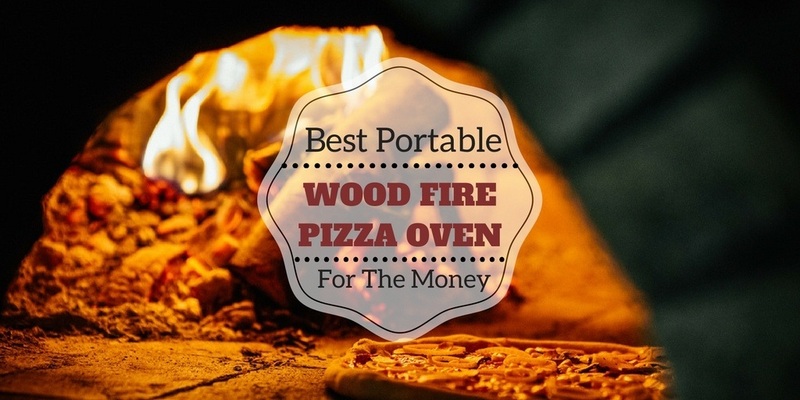 It offers similar features but at a cheaper price. Venterior portable fish finder can be used on any fishing environment be it a lake, river, or sea. Venterior portable fish finder has a round transducer attached to a 25 feet cable. 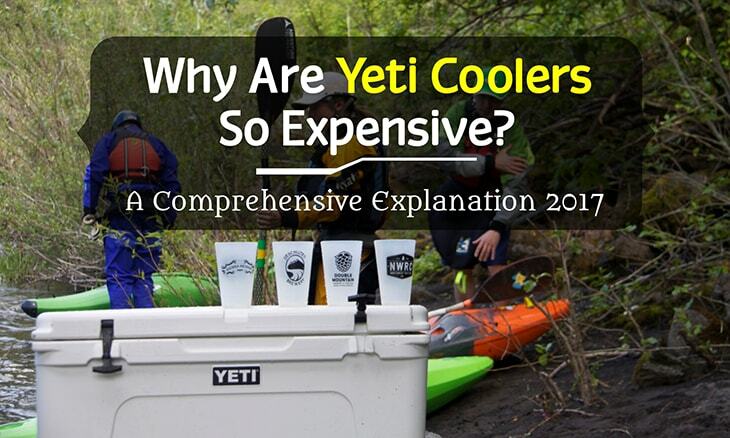 It also includes a removable float, which can come in handy when ice fishing or fishing off the dock. Venterior portable fish finder transducer has a transmission range of between 3ft to 328 ft. below the water surface. The transducer of the Venterior portable fish finder is fitted with five different sensitivity levels. This feature improves the signal strength of the transducer allowing anglers to achieve accurate mapping results of underwater environments. An inbuilt fish alarm goes off whenever the transducer detects a nearby shoal of fish. Venterior portable sonar has an LCD screen display. This improves the visual clarity of the display making readings transmitted from the transducer more accurate. 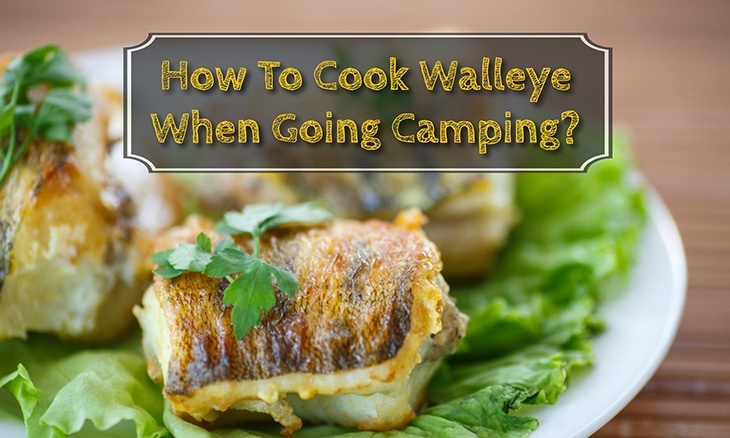 The screen is backlit as well to improve readability during night fishing. The transmitter is waterproof and will go to any depth you want below the water surface. Venterior offers this cheaper version of their superior fish finder to any angler on a budget. It works exactly like the advanced version but with a shorter depth range comparatively. This pocket-friendly Venterior portable fish finder can be useful to the angler who is just starting out in fishing. Venterior portable fish finder has a depth range of between 3feet to 320 feet. The transducer comes with a 25 feet cable and a detachable floater. 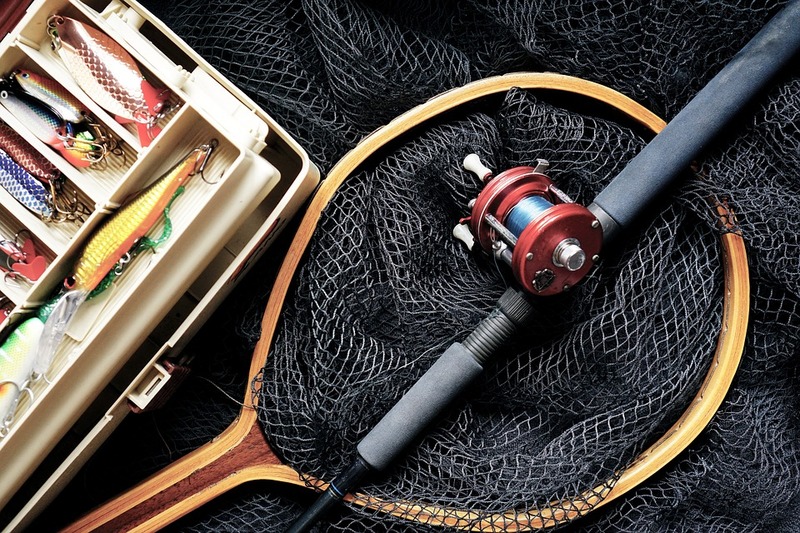 You can accurately map out the environment of any lake, river, or pond you are fishing in. 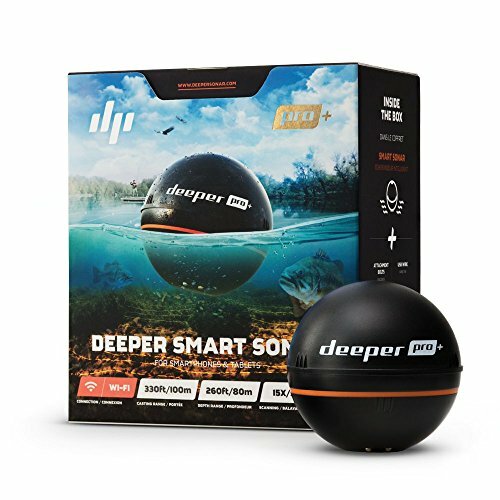 Venterior portable fish finder will give details about the surrounding like how tall or short underwater vegetation is, whether the waterbed is filed with rocks and sand, or even pinpoint the exact location of fish. 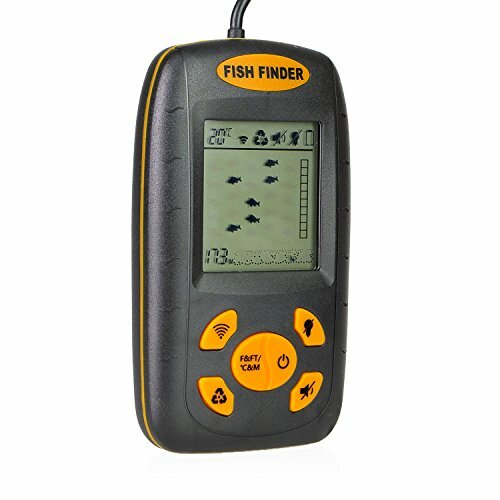 More features on this portable fish finder by Venterior is the fish alarm, backlight mode, and the battery saver mode. You can also convert the unit of measures, when gauging depth and temperature, by pressing and holding both the C&M and F&FT buttons for at least 3 seconds. FishHunter portable sonar is recommended to any serious angler who wants to be spot on with their fishing. The transducer has five frequency levels that adjusts its sensitivity to both near and far underwater objects. This feature alone can increase your mapping coverage by 5 times more than what you get from a cheap fish finder. A unique feature of the FishHunter Portable fish finder is the 3D display. The transducer supports connectivity to a tablet or smartphone via Wi-Fi. This provides a faster way to relay information about the composition of the underwater environment in high-res 3D. 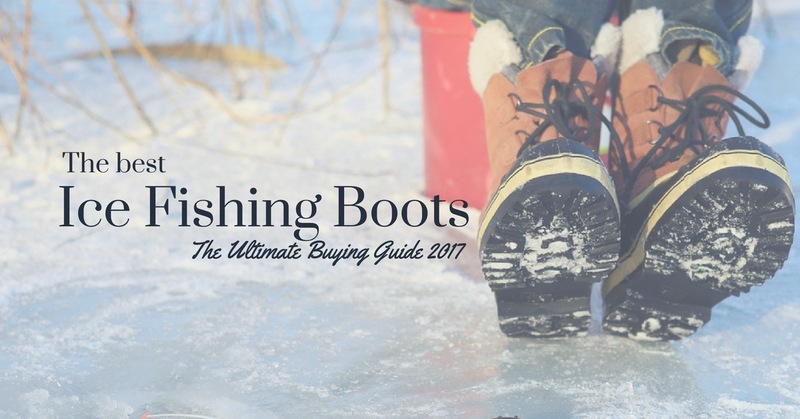 With an upgrade of the display, anglers have a chance to be more directional with their fishing especially when fishing in ice. FishHunter portable fish finder can stay connected to a smartphone or tablet within a range of 150 feet. 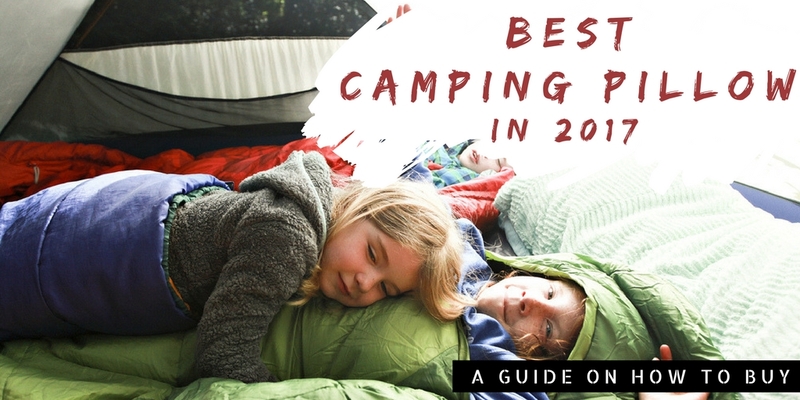 You do not require cellular data, internet, or cell phone reception for connectivity. The depth range of the transducer is 160 feet in moving water, and 150 feet in a frozen static waterbed. You can cast the Fishunter portable fish finder while on a boat, or canoe moving at speeds of up to 2MPH. 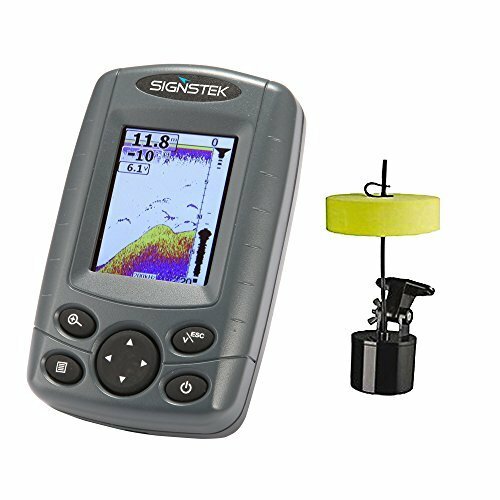 Signtek portable fish finder also falls in the category of high performance castable sonars. It features a 2.4-inch TFT display with over 512 hues and is resistant to UV rays. In addition, the screen has an LED backlight which cane help improve visibility when fishing at dawn or dusk. Signtek castable sonar features a sensitivity adjustor that is tunable up to 100 levels. In addition, this portable fish finder has a multi-level range that reaches 20meters below sea level. A colorful screen displays vivid pictures of underwater environments like the bottom contours of the lake or river. In addition, this castable sonar can pin the exact location of fish and gauge the different temperature levels of the water. Signtek FF-003 castable sonar can be used by both amateur and professional anglers. The fish finder transducer has a frequency of 200 kHz and incorporates a depth and fish alarm to notify anglers when to get their fishing rods ready. 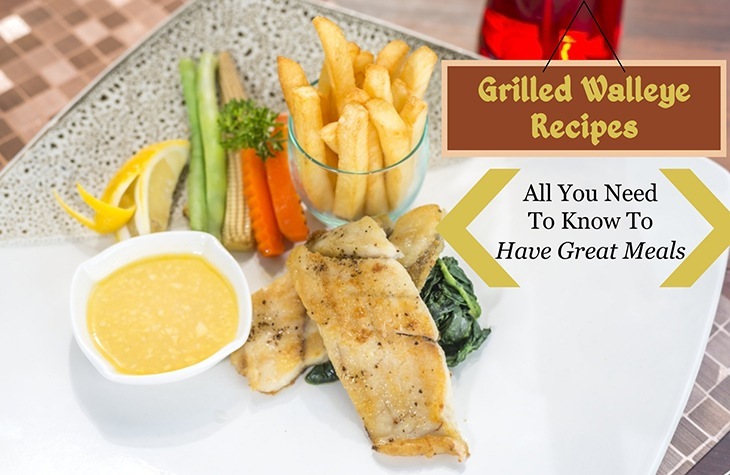 A multi-lingual menu allows you to personalize the display to a language you understand. Garmin Striker 4 fish finder can give a wider view of whatever lies underneath the water surface. 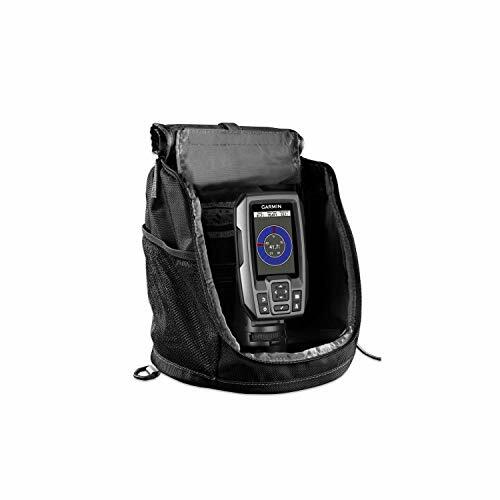 This pro-level castable sonar comes with a portable kit that features either a 3.5-inch, 5-inch, or 7-inch display receiver. Garmin striker 4 castable sonar has a waterproof transducer that is capable of sending several vibrations that cover a wider area. With more frequencies hitting the receiver, the angler can map out a more accurate view of the surrounding. 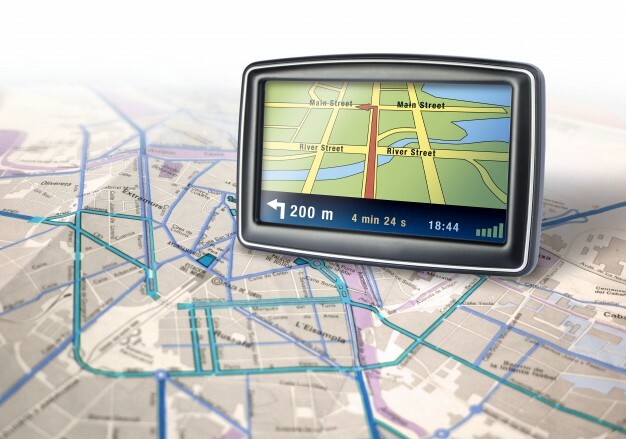 The wide display includes feature known as waypoint mapping. This feature allows anglers to establish obstacles along the fishing route or pinpoint the exact location of fish. Garmin Striker 4 fish finder is fitted with a super-sensitive GPS tracker. This together with the sonar transducer of 200 w RMS transmitting power can assist in accurately distinguishing underwater features. This technology can help anglers to identify the exact location of fish by separating it from its surroundings. What’s more, anglers have an option of upgrading their kit with a GT8 or GT15 CHIPR transducer. These two transducers have more frequency and transmitting power that can come in handy in difficult fishing conditions like murky water. This Garmin 010-01550-00 fish finder is an advanced version of the original Striker 4. It features a 3.5-inch display, which is the only available screen size. 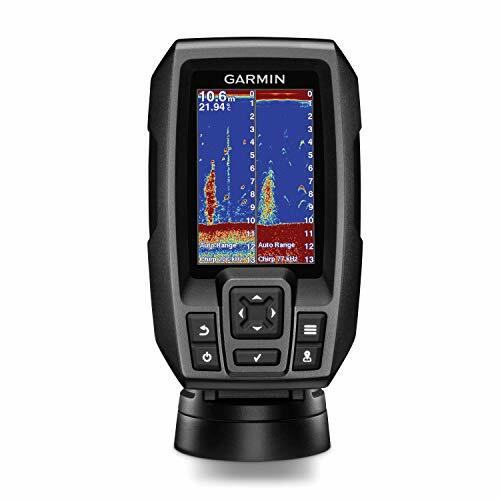 Like all other Garmin fish finders, the 010-01550-00 model has a sonar transducer fitted with CHIRP technology. This gives the transducer an ability to transmit signals with a 200 KHz frequency at a power of 200w RMS. 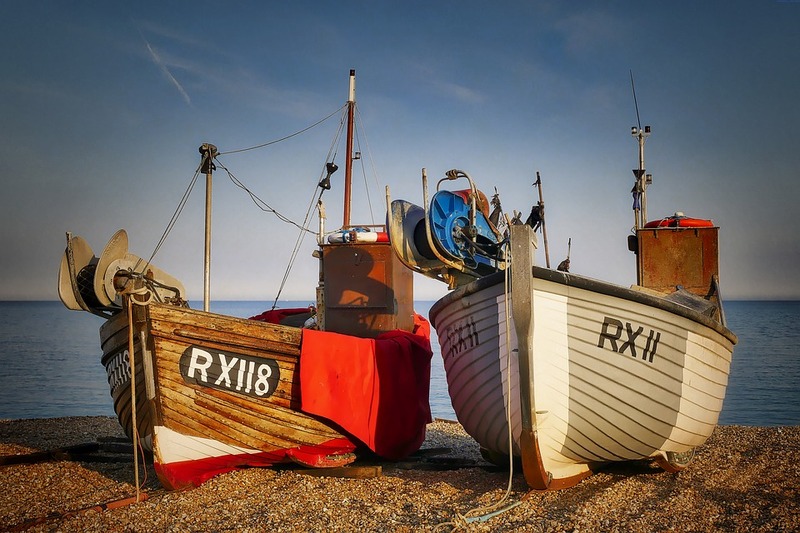 With an inbuilt ultra-sensitive GPS system, anglers are able to map out fishing hotspots and the obstacles to avoid along their fishing route. Anglers also have the option to upgrade to stronger transducers like the high-performing GT8 and GT15 models. These upgrades are sold separately and available on request. Garmin 010-01550-00 fish finder can improve your chances of locating hotspots for fish. The wide display is calibrated with vivid graphics that provide useful images that tell you exactly what is happening under water. This Garmin fish tracker also connects wirelessly to other sonars allowing anglers to share fishing information with each other. HawkEye FTI fish finder has a black and white dot finder display. For several more dollars, it is possible to upgrade to a colored HD screen with more details. HawkEye FT1PX is also available in a simple looking display called the Virtuview Icon screen. 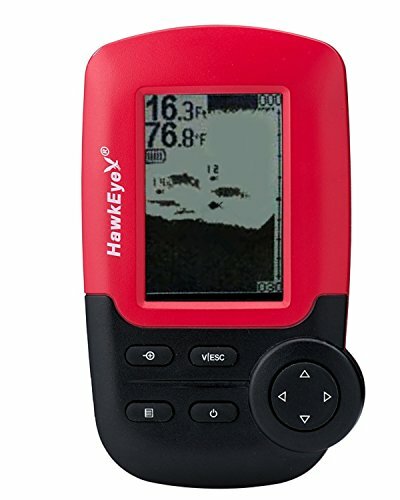 This Dot Matrix fish finder by Hawkeye is designed to fit the palm of an adult angler. Alternatively, you can mount the portable sonar on your boat as a reference point when hunting for bass or pike. The inbuilt transducer has dual frequency technology, which improves performance of the device whether you are trying to gauge exact water depth or identifying the best fishing spots. HawkEye FT1PX dot matrix fish finder can be suitable for the mid-level angler wanting to locate the best fishing spots. 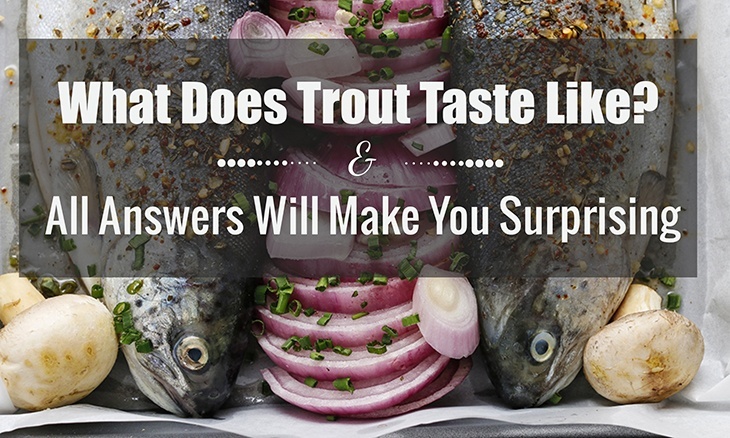 The dot matrix displays fish as icons and one can fine-tune the images to be more detailed. The sonar transducer has a 10 level modification to improve the acuteness of the signals transmitted to the receives. You can also zoom in on the screen to mark the precise location of your catch. FISHINGSIR castable fish find is a wireless sonar that can be suitable for a pro-level angler. It packs plenty of features designed to help anglers spot and catch fish faster quicker. 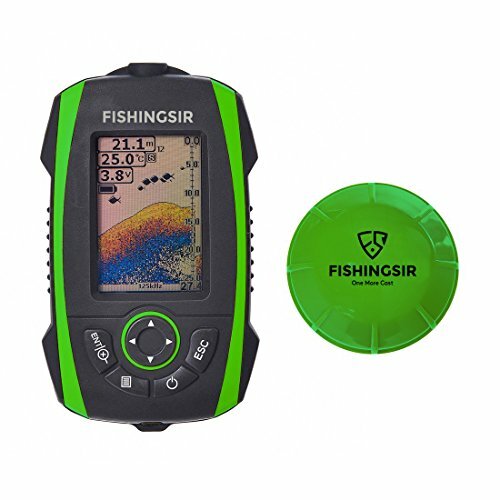 FISHINGSIR fish finder comes in a green black receiver and an all green transducer. 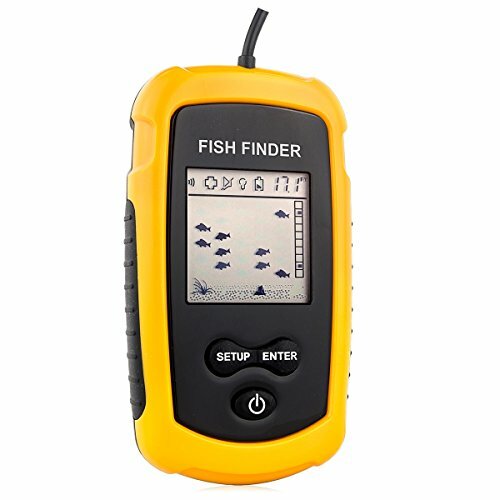 This portable fish finder has a 2.8inch LCD display calibrated with 512 colors. The LCD display is UV treated making the screen readable even in direct sunlight. The outer black-green outer casing has a rugged design and can withstand harsh marine environments and still provide optimum performance. In addition, the rugged outer cover has a waterproof rating of IP67, which means it can be used on kayaks, boats. Canoes, as well as docks. The transducer has a transmission range of up to 328 feet below the water surface. Wave vibrations are emitted at a frequency of 2.4GHZ to cover a wider area and provide more vivid details of the underwater geography. 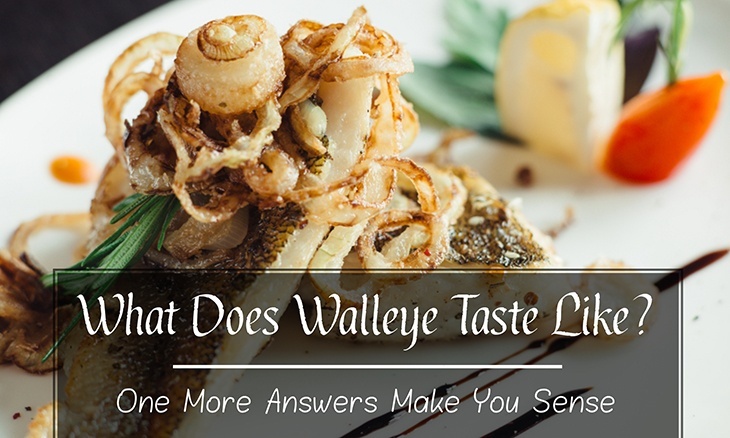 High pressure and sensitivity levels can make it possible to identify the exact location of fish and the distance they are from the floor of the waterbed. Every angler needs a fish finder that can map out any environment below the surface of a lake or pond. Modern sonars have the ability to map an entire waterbed while ashore. 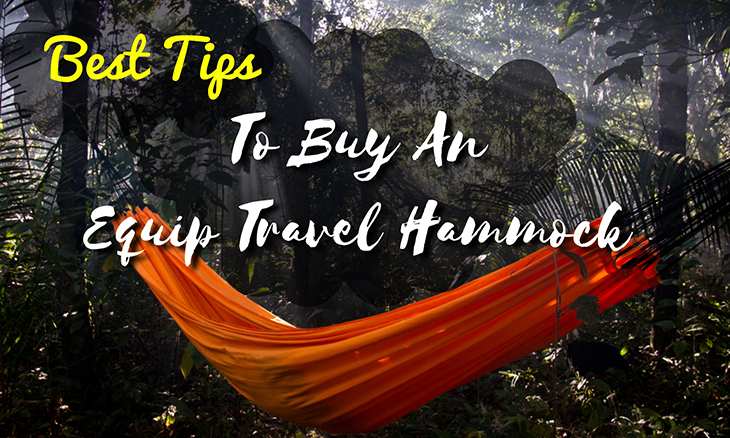 In addition, an inbuilt GPS system can help the angler find fishing spots faster and even remember those spots the next time they go back fishing. Range defines the distance the angler can cast the transducer and still get good reception on their receiver. It also defines the depth an angler can cast the transducer and still be able to send vibrations that will reach the transmitter. This is the main component of a fish finder. The main function of the transducer is to send out sound waves that will help you determine fish location. The sound waves that the transducer transmits bounce back once they reach the objects, presumably fish, underwater. An important factor to consider about the transducer is its cone angle. The larger the cone angle the better the view you will obtain of objects that are underwater. The best sonar fish finder on the market today is highly advanced compared to what was available years ago. As an angler, one has to understand the primary features required on a standard fish finder on the market. 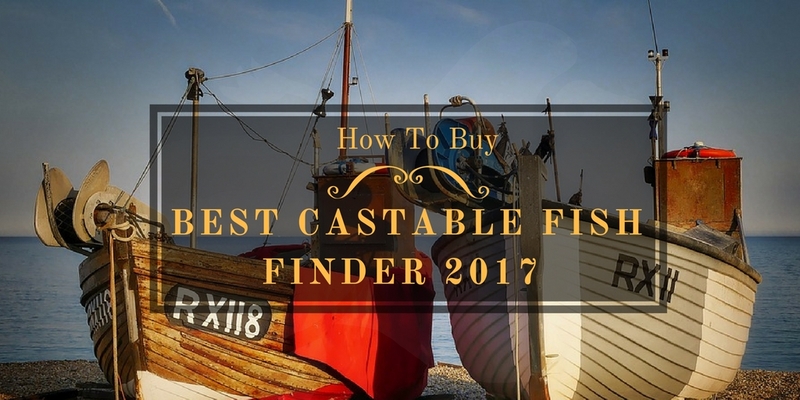 Getting the ideal castable fish finder means finding a sonar that has all the features you need and at a pocket friendly rate. Deeper Smart Sonar Pro+ is the editor’s choice because it packs all the advanced features at a reasonable price. It synchronizes with iOS and android devices without the need for cellular data, internet, or cell tower reception. It comes with a waterproof transducer with a range of up to 330 feet below the water surface. The inbuilt GPS tracker also improves mapping accuracy in any environment. Lastly, Deeper Smart Sonar Pro+ is reasonably priced compared to other sonar brands with the same features.